The majority of our readers told us their attorneys received less than the $6,000 maximum allowed fee. If you’ve become disabled and haven’t been able to work, you may be wondering if you can get benefits through Social Security Disability Insurance (SSDI) or Supplemental Security Income (SSI). An attorney can help you through the process, but what would you have to pay for legal help? We surveyed readers across the U.S. who applied for SSI or SSDI to ask about their experiences and the outcome of their applications. Here’s what we learned about the cost of working with a lawyer. Even though disability attorneys’ fees are usually capped at $6,000, nearly seven in ten of our readers (68%) told us their attorneys received less than that amount. The overall average was $3,750—quite a bit lower than the cap. For those whose initial application was approved, the average was even lower: $3,100. When a case went to an appeal hearing, the average amounts were higher. More than half of readers who got an award after a hearing decision reported that their lawyers were paid the maximum of $6,000, with an average fee of $4,600. People applying for SSI may also be interested to know that the payments to disability lawyers in these cases tend to be lower. 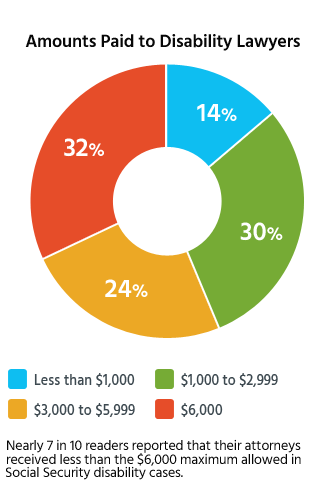 Our survey showed that the overall average attorney’s fee was $2,900 in SSI cases. Aside from the fact that lawyers generally won’t receive a fee if their clients don’t get an award for Social Security disability, a few of our readers’ attorneys didn’t take any payment even when they won the case. 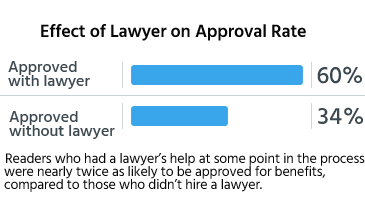 This was more likely to happen at the initial application stage, where nearly two in ten readers (19%) reported that their lawyers took no payment. It isn’t surprising that this number was lower (5%) at the appeals stage, when an attorney has to spend a considerable amount of time preparing for the hearing and gathering evidence. Which lawyers are likely to waive their fee for helping with an application? Some lawyers dedicate a portion of their time to doing “pro bono” work (without charge). They usually reserve this work for disability claimants who have very severe medical conditions and who are in dire financial straits. These claimants often have clear-cut cases and are approved at the initial decision stage, and an attorney doesn’t have to spend much time to help with such an application. Similarly, there are legal aid clinics, disability rights clinics, law school clinics, and nonprofit law firms that have staff attorneys or students who will help file disability applications; in some cases, the clinic will waive their fee. But don’t count on this. 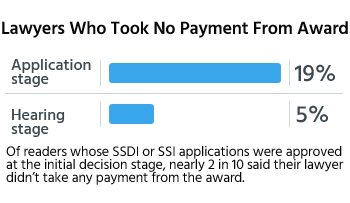 Many legal aid organizations stopped helping with disability claims when the SSA started paying attorneys directly out of SSI backpay awards (which led more attorneys outside of those clinics to take on SSI cases). "Get a good disability lawyer. It's worth it!" In addition to lawyers’ fees, applicants are usually responsible for paying their attorneys for the out-of-pocket costs of pursuing the case, such as any charges for copying medical and work records. However, these costs rarely add up to more than $200 (not including the costs of any necessary medical examinations, which the applicants would generally pay for directly). Are Lawyers Worth the Cost?